Entrapment neuropathies of the upper extremity are common problems. A wide range of physicians, from primary care providers to specialists such as orthopedic surgeons, plastic surgeons, or neurosurgeons, are sought to care for these problems. For patient education resources, see the Hand, Wrist, Elbow, and Shoulder Center and Procedures Center, as well as Repetitive Motion Injuries and Carpal Tunnel Syndrome. Anatomy of median nerve along its course in upper extremity. 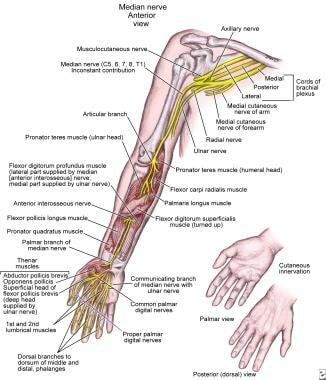 The main nerve entrapments in the upper extremity involve the median nerve, ulnar nerve, or radial nerve. The median nerve forms the junction of the lateral medial cords. It travels lateral to the brachial artery to approximately the mid humerus or junction of the proximal two thirds to distal one third of the humerus. At this level, the median nerve crosses over the brachial artery to lie in a more medial anatomic position. The nerve is superficial to the brachialis muscle and usually lies in a groove with the brachial artery, between the brachialis and biceps muscle. It travels across the antecubital fossa, underneath the bicipital aponeurosis, and between the biceps tendon and the pronator teres. At this level, the median nerve is on the distal aspect of the brachialis muscle. The nerve then travels underneath the 2 heads of the flexor digitorum sublimis (FDS) muscle to lie between this muscle and the flexor digitorum profundus (FDP) muscle. The median nerve emerges between these 2 muscles in the distal forearm to then travel ulnar to the flexor carpi radialis and radial to the sublimis tendons, usually directly underneath the palmaris longus tendon, and enters the carpal tunnel in a more superficial plane to the flexor tendons. The motor branch emerges at variable sites but most frequently at the distal aspect of the carpal ligament to service the thenar musculature. Just beyond the end of the carpal ligament, the median nerve trifurcates to become the common digital sensory nerves to the fingers. The palmar cutaneous branch of the median nerve is a sensory branch that comes from the main body of the nerve approximately 6 inches above the rest of the nerves and services an elliptical area at the base of the thenar eminence. This superficial nerve does not lie within the carpal tunnel. Just distal to the antecubital fossa, the median nerve branches into the anterior interosseous nerve, which travels on the interosseous membrane and innervates the flexor pollicis longus (FPL), the FDP to the radial 2 digits, and the pronator quadratus at its termination. The nerve innervates the pronator teres, flexor capri radialis, the FDS, and the 2 radial FDP tendons. It also supplies the FPL and the pronator quadratus. Within the hand, the motor branch of the median nerve supplies the opponens pollicis, the flexor pollicis brevis, and the abductor pollicis brevis musculature. It also supplies the 2 radial lumbrical muscles in the hand. The median nerve supplies sensation to the 3.5 digits on the radial aspect. The ulnar nerve arises from the medial cord of the brachial plexus. The ulnar nerve travels posterior to the brachial artery and remains within the flexor compartment of the upper extremity until it reaches the medial epicondyle. The nerve travels behind the medial epicondyle back into the flexor compartment underneath the flexor musculature. Above the elbow, the ulnar nerve lies on the long head and then the medial head of the triceps muscle, directly posterior to the medial intermuscular septum between the brachialis and the triceps muscles. The fascial bands over the median nerve constitute the Struthers arcade. The nerve passes within the cubital tunnel posterior to the medial epicondyle. It is directly underneath a tight fascial roof known as the Osborne band, which is contiguous with the leading fascial heads of the flexor carpi ulnaris (FCU) muscle. Just above the elbow branches, the nerve branches to the superficial head of the FCU. The nerve lies directly over the top of the FDS muscle and beside the FDP muscle at the elbow. As the ulnar nerve travels down the forearm, it is wedged between the FDS and the FDP muscle bellies to exit in the distal forearm just ulnar to the ulnar artery and the FDP tendons. The FCU tendon protects the nerve on its ulnar aspect. The ulnar nerve travels within the Guyon canal at the wrist to supply the hypothenar muscles, including the opponens digiti quinti and the abductor digiti quinti. It also supplies the 2 ulnar lumbrical muscles and the interossei to the hand and the deep branch to the flexor pollicis brevis muscle. The ulnar nerve supplies sensation to the 1.5 digits of the ulnar aspect. The dorsal cutaneous branch of the ulnar nerve supplies sensation to the dorsal ulnar half of the hand and fingers. This nerve arises from the main ulnar nerve approximately 6 cm proximal to the wrist. The radial nerve emerges from the posterior aspect of the humerus in the spiral groove between the brachialis and brachioradialis muscles above the elbow. It leaves the extensor compartment to travel in front of the elbow underneath the brachioradialis muscle, sending branches of innervation to it just above the elbow. The radial nerve divides at the level of the radial capitellar joint into the deep motor branch of the radial nerve (ultimately becoming the posterior interosseous nerve) and the superficial radial nerve. At this point, it branches to the extensor carpi radialis brevis. The superficial radial nerve continues to travel underneath the brachioradialis muscle to ultimately emerge between that muscle and the extensor carpi radialis longus tendon. The superficial radial nerve supplies sensation to the radial half of the dorsum of the hand. The deep motor branch of the radial nerve travels within the fat pad and runs below the supinator muscle to emerge the supinator and become the posterior interosseous nerve in the distal dorsal aspect of the forearm. The posterior interosseous nerve travels at the level of the interosseous membrane to ultimately provide sensation to the posterior aspect of the wrist. This nerve innervates the extensor indicis proprius, extensor digiti quinti, extensor carpi ulnaris, abductor pollicis longus, extensor pollicis brevis, and extensor digitorum communis muscles. Many of the findings of peripheral nerve irritation or entrapment are identified during the physical examination and are discussed here in relation to each of the individual syndromes. Reproducing symptoms via provocative maneuvers or diagnosing deficits in strength or sensation can be accomplished in the office or with the aid of hand therapists. Two-point discrimination testing, Semmes-Weinstein monofilament testing, and grip strength measurements are simple and inexpensive means of evaluation. Findings from imaging studies (eg, plain radiographs, MRIs) are occasionally helpful for excluding cervical ribs, lung tumors, or extremity masses, which may be contributing to neural compression. Electrodiagnostic studies (eg, EMG, nerve conduction studies) remain the criterion standard for objective evaluations of neuropathic conditions. These studies are not without flaws; they are highly operator-dependent and the results do not always correlate with the severity of symptoms or patient outcomes. Despite these drawbacks, they may help confirm equivocal physical examination findings or help isolate the specific site of compression preoperatively. EMGs also may be used to verify progression or resolution in neurophysiology following surgical release. These include the lacertus fibrosus (bicipital aponeurosis, superficial forearm fascia), the Struthers ligament (thickened or aberrant origin of pronator teres from distal humerus), the pronator teres (musculofascial band or compression between 2 muscular heads), and the FDS proximal arch or the flexor digitorum superficialis. These include pain in the volar forearm that is exacerbated with activity and relieved by rest; decreased sensation in the thumb, index finger, long finger, and radial side of the ring finger; weakness of thenar muscles; and a positive Tinel or Phalen sign in the proximal forearm. Nonsurgical or conservative treatment includes rest and anti-inflammatory medications. Surgical treatment includes exploration of the median nerve in the proximal forearm, an incision distal and more or less proximal to the antecubital fossa in a zigzag fashion across the joint, and the release of all sites of possible compression. The anatomy includes the branch of the median nerve arising approximately 6 cm below the elbow and supplying motor function from the FPL, pronator quadratus, and FDP to the index finger. Causative factors include tendinous bands, a deep head of the pronator teres, accessory muscles (including the Gantzer muscle, which is the accessory head of the FPL), aberrant radial artery branches, and fractures. These include vague pain in the proximal forearm and weakness of the FPL and FDP to the index finger. Affected persons cannot form a circle by pinching their thumb and index finger (ie, hyperextension of index distal interphalangeal joint and thumb interphalangeal joint). Sensory involvement is not described. Nonsurgical treatment includes rest, anti-inflammatory medications, and splints. Surgical treatment includes exploration of the median nerve through an approach similar to that for pronator syndrome, release of the lacertus fibrosus and division superficially more or less to the deep heads of the pronator teres, and ligation of crossing vessels. The carpal tunnel is formed by carpal bones (floor), the transverse carpal ligament (roof), the scaphoid and trapezium (radial aspect), and the pisiform and hook of the hamate (ulnar aspect). The tunnel contains 4 FDS muscles, 4 FDP muscles, the FPL, and the median nerve. Causative factors may include accessory muscles (manus)/lumbricals, tenosynovitis, rheumatoid arthritis, type 1 diabetes mellitus, pregnancy, a ganglion, foreign or loose bodies, repetitive motion, carpal fractures or dislocations, or a persistent median artery. These include decreased sensation, paresthesias, and tingling in the distribution of the median nerve; worsened symptoms with repetitive use; night awakening with tingling or numbness; radiation of pain up the forearm; a positive Tinel or Phalen sign or compression at the wrist; and possible thenar muscle wasting with advanced cases. EMG or a nerve conduction velocity study can be used in difficult cases or with polyneuropathy. Occasionally, radiographs help rule out occult fractures, a foreign body, or tumors. Laboratory studies may include an erythrocyte sedimentation rate, blood glucose value, thyroid evaluation, and rheumatoid factor. Nonsurgical measures include wrist splinting in a neutral position to minimize intratunnel pressures at night due to posture; anti-inflammatory medications; steroid injections for transient relief; and an alteration of work station arrangement or the amount of repetitious motion, with breaks or a total change in work activities. [8, 9, 10] Surgical therapy is indicated in refractory cases or those not responsive to nonsurgical measures. All surgical techniques focus on release of the volar transverse carpal ligament. Different incisions are used for an open approach or, more recently, endoscopic release; both (ie, endoscopic and open) have advantages and disadvantages. The main goal is complete release of the ligament without injury to the palmar cutaneous, thenar, and main branch of the median nerve. These may include bleeding, infection, and a tender scar; injury to nerves, palmar arch vessels, or tendons; failure to completely release the ligament; and recurrence. The ulnar nerve runs adjacent to the medial head of the triceps into the groove behind the medial epicondyle of the humerus. It passes beneath the fascia joining the 2 heads of the FCU and lies on the superficial surface of the FDP. These include the Struthers arcade, the anconeus epitrochlearis, the intermuscular septum, the Osborne band, and the aponeurosis of the FCU. Simple decompression may fail to prevent subluxation or traction on the nerve. Epicondylectomy is painful and may make trauma to the nerve more common. Unless subluxation is the cause of symptoms, relief may be incomplete. Transposition of the nerve allows for more slack in the nerve course, but this can cause a kink at the Struthers arcade if improperly released. Subcutaneous placement often results in painful paresthesias with simple local trauma. With more extensive dissection, more vascular supply is interrupted and may cause further injury to the nerve. Placing the nerve in a well-vascularized bed (submuscular transposition) may aid in recovery from or may help prevent recurrent symptoms. Submuscular transposition requires longer immobilization postoperatively to allow flexors to heal, thereby increasing risks of stiffness and reflex sympathetic dystrophy. All surgical approaches can injure the medial brachial and antebrachial cutaneous nerves, causing painful scars and neuromatous pain. This is the triangular canal at the base of the ulnar side of the palm. It is bordered laterally by the hook of the hamate and the transverse carpal ligament. The medial wall is formed by the pisiform and the attachments of the pisohamate ligament. Both the ulnar nerve and artery traverse the canal to enter the hand. The dorsal cutaneous branch of the ulnar nerve branches before the nerve enters the Guyon canal. Causative factors include repeated blunt trauma from power tools and gripping or hammering with the palm of the hand. Fractures of the hook of the hamate can impinge on the nerve. Other etiologies include tumors such as ganglia or lipomas, anomalous muscle bellies, or hypertrophy of the palmaris brevis. Thrombosis or aneurysm of the artery may compress the nerve. These may include numbness and tingling, paresthesias and pain in an ulnar distribution of the palm and the 1.5 digits of the ulnar aspect, cold intolerance in the ring and small fingers, normal sensation in the dorsal sensory cutaneous branch of the ulnar nerve, and a positive Tinel or Phalen sign. Nonsurgical treatment includes rest and avoidance of provocative activities. Immobilization with a splint and corticosteroid injections are also effective. Surgical treatment includes surgical decompression of the Guyon canal through the carpal tunnel or through a zigzag wrist crease–traversing incision. Complete exploration should be performed to help exclude a mass or aneurysm that requires repair. Compression neuropathy of the radial nerve is considered somewhat more rare than the other compression neuropathies of the upper extremity. The radial tunnel proper is somewhat ill defined, but it is usually considered the area where the radial nerve exits between the brachioradialis and the brachialis muscles to where it drives below the proximal edge of the supinator muscle (Frohse arcade) and distal edge of the supinator. The deep branch of the radial nerve can be compressed by 5 structures within the radial tunnel. The most common site of compression is at the proximal fibrous edge of the supinator muscle, known as the arcade of Frohse. The most proximal structure that can compress the deep branch of the radial nerve is the fibrous fascia over the radiocapitellar joint. The next structures that can compress the deep branch of the radial nerve are the radial recurrent artery and the venae comitantes, known as the leash of Henry, although this is uncommon. Lastly, the deep branch of the radial nerve can also be compressed by the distal edge of the supinator muscle, which is known to be fibrous in 50-70% of patients. These may include pain in the upper extensor forearm; dysesthesia in a superficial radial nerve distribution; and weakening of the extension of the fingers, thumb, or wrist. Surgical treatment includes release of the muscle and superficial slip of the supinator ligation and transection of the vascular leash or release of the fascial bands. The supinator muscle should also be released. Causes may include entrapment of the nerve within supinator muscle, distal edge of the supinator muscle fracture or dislocation of the radial head, tumors (eg, ganglion, lipoma), and iatrogenic causes resulting from open reduction/internal fixation of proximal radius fractures. Patients may report proximal forearm pain. No sensory deficit is described, but partial-to-complete motor paralysis of the extensors is reported. Often, the brachioradialis and extensor carpi radialis brevis/extensor carpi radialis longus, which are innervated by more proximal branches, are spared. Therefore, any remaining wrist extension also displays radial deviation. Surgical exploration and decompression through an approach similar to that for radial tunnel syndrome is warranted. The superficial radial nerve exits between the brachioradialis and the extensor carpi radialis longus tendons at the junction of the proximal two thirds to distal one third of the forearm. The superficial radial nerve then courses in a superficial subcutaneous plane to provide sensation to the dorsal aspect of the hand from the thumb to the junction of the ring and long fingers. Sensation to the digits is provided up to the area of approximately the dorsal proximal interphalangeal joint. Fascial bands in the subcutaneous plane at its exit site, the tendons of the brachioradialis, and the extensor carpi radialis longus tendons compress the nerve. Patients report decreased sensation, paresthesia, and tingling in the distribution of the superficial radial nerve. A position Tinel and compression sign is present at the site of exit of the superficial radial nerve. The symptoms are often provoked by extreme pronation of the wrist. Nonsurgical treatment includes wrist splinting in a neutral position and anti-inflammatory medication, which may decrease symptoms in the early stages. Surgical treatment includes surgical resection of part of the brachioradialis tendon to allow for an easy glide motion of the superficial radial nerve at its exit point. Shiri R, Miranda H, Heliovaara M, Viikari-Juntura E. Physical work load factors and carpal tunnel syndrome: a population-based study. Occup Environ Med. 2009 Jun. 66(6):368-73. [Medline]. Debek A, Czyrny Z, Nowicki P. Sonography of pathological changes in the hand. J Ultrason. 2014 Mar. 14 (56):74-88. [Medline]. [Full Text]. Dellon AL. Review of treatment results for ulnar nerve entrapment at the elbow. J Hand Surg [Am]. 1989 Jul. 14(4):688-700. [Medline]. DeStefano F, Nordstrom DL, Vierkant RA. Long-term symptom outcomes of carpal tunnel syndrome and its treatment. J Hand Surg [Am]. 1997 Mar. 22(2):200-10. [Medline]. Adelaar RS, Foster WC, McDowell C. The treatment of the cubital tunnel syndrome. J Hand Surg [Am]. 1984 Jan. 9A(1):90-5. [Medline]. Cravens G, Kline DG. Posterior interosseous nerve palsies. Neurosurgery. 1990 Sep. 27(3):397-402. [Medline]. [Guideline] Keith MW, Masear V, Chung K, et al. Diagnosis of carpal tunnel syndrome. J Am Acad Orthop Surg. 2009 Jun. 17(6):389-96. [Medline]. [Full Text]. [Guideline] Keith MW, Masear V, Amadio PC, et al. Treatment of carpal tunnel syndrome. J Am Acad Orthop Surg. 2009 Jun. 17(6):397-405. [Medline]. [Full Text]. Shi Q, Bobos P, Lalone EA, Warren L, MacDermid JC. Comparison of the Short-term and Long-term Effects of Surgery and Nonsurgical Intervention in Treating Carpal Tunnel Syndrome: A Systematic Review and Meta-analysis. Hand (N Y). 2018 Jul 1. 1558944718787892. [Medline]. [Guideline] American Academy of Orthopaedic Surgeons. Management of carpal tunnel syndrome: evidence-based clinical practice guideline. Available at https://www.aaos.org/uploadedFiles/PreProduction/Quality/Guidelines_and_Reviews/guidelines/CTS%20CPG_2.29.16.pdf. Feb 29, 2016; Accessed: Aug 7, 2018. Wilson TJ, Tubbs RS, Yang LJ. The anconeus epitrochlearis muscle may protect against the development of cubital tunnel syndrome: a preliminary study. J Neurosurg. 2016 Feb 12. 1-6. [Medline]. Ochi K, Horiuchi Y, Nakamichi N, Morita K, Okada E, Hasegawa T. Association between the elbow flexion test and extraneural pressure inside the cubital tunnel. J Hand Surg Am. 2011 Feb. 36(2):216-21. [Medline]. Svernlov B, Larsson M, Rehn K, Adolfsson L. Conservative treatment of the cubital tunnel syndrome. J Hand Surg Eur Vol. 2009 Apr. 34(2):201-7. [Medline]. Koziej M, Trybus M, Banach M, et al. Comparison of Patient-Reported Outcome Measurements and Objective Measurements after Cubital Tunnel Decompression. Plast Reconstr Surg. 2018 May. 141 (5):1171-81. [Medline]. Gaspar MP, Jacoby SM, Osterman AL, Kane PM. Risk factors predicting revision surgery after medial epicondylectomy for primary cubital tunnel syndrome. J Shoulder Elbow Surg. 2016 Apr. 25 (4):681-687. [Medline]. Bacle G, Marteau E, Freslon M, et al. Cubital tunnel syndrome: comparative results of a multicenter study of 4 surgical techniques with a mean follow-up of 92 months. Orthop Traumatol Surg Res. 2014 Jun. 100(4Suppl):S205-8. [Medline]. Buchanan PJ, Chieng LO, Hubbard ZS, Law TY, Chim H. Endoscopic versus Open In Situ Cubital Tunnel Release: A Systematic Review of the Literature and Meta-Analysis of 655 Patients. Plast Reconstr Surg. 2018 Mar. 141 (3):679-84. [Medline].